Pickens, who served eight years in the Florida Legislature, shared details with the students about the origins of his public service career and the invaluable lessons he learned along the way. While Pickens described his legislative service as “rewarding and fulfilling,” he stated that his spark for government wasn’t always apparent. 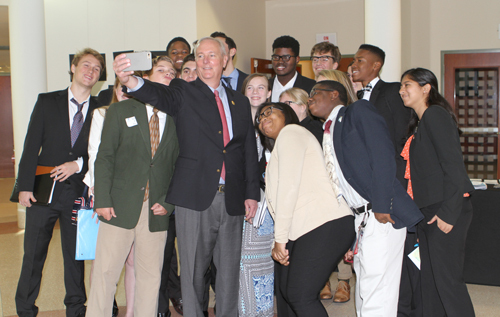 St. Johns River State College President Joe Pickens, who served eight years in the Florida Legislature, takes a selfie with high school student delegates after serving as guest speaker for the YMCA of Florida’s First Coast Youth in Government High School Showcase held at the St. Johns County Administration Building. The Showcase gives high school delegates the opportunity to practice and prepare for the 2017 Youth in Government State Assembly. 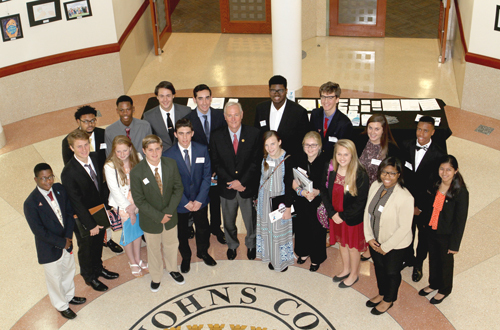 President of St. Johns River State College Joe Pickens, who served eight years in the Florida Legislature, spends time with high school delegates at the YMCA of Florida’s First Coast Youth in Government High School Showcase held at the St. Johns County Administration Building. The Showcase gives high school delegates the opportunity to practice and prepare for the 2017 Youth in Government State Assembly.